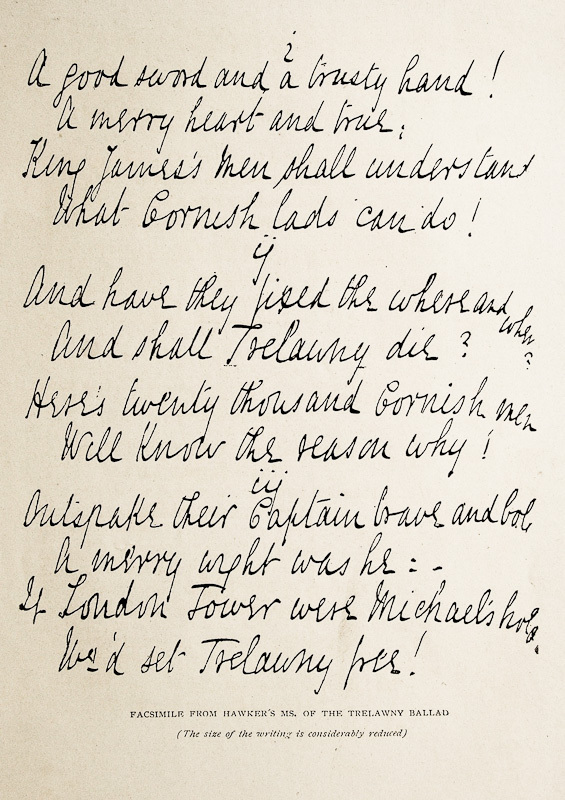 Facsimile from Hawker’s manuscript of the Trelawny ballad, from Cornish Ballads & Other Poems. Hawker was in his early twenties and a newly-married undergraduate at Oxford when he wrote ‘The Song of the Western Men’ in 1825, while staying with his wife, Charlotte, in a cottage on the southern boundary of Morwenstow parish. (See Cornish Ballads and Other Poems, p.2. for this date. In Life and Letters, p. 23, Hawker gives the year as 1824). – Kev Thompson on YouTube: out of all the various versions this one sounds most as I imagine it would have done in Hawker’s lifetime. – ‘Trelawny’ being sung in Helston on Flora day 2008. – ‘Trelawny’ sung in Cornish with English subtitles. – And finally, a little clip of what’s described as ‘Cornish Anthem (The Real One)’. Don’t miss this, it’s lovely. In a letter written to a friend in 1855, Hawker refers to Charlotte, as ‘My wife, who knows all music, I believe, that was ever published’. Despite their financial difficulties he managed to purchase a piano for her, paid for by installments (Life and Letters p. 217). Writing to Miss Louisa Clare in 1862, only a year before Charlotte’s death, he assures her that ‘…your Trelawny music is by all appreciated and admired. My Ballad was sung to your Notes last night, at a concert in Kilhampton, by Mr. Thynne, the Rector, as you will see by the inclosed programme. He rehearsed it here at Mrs. Hawker’s Piano a few days ago, & gratified us exceedingly…’ (p.269). Portrait of Bishop Trelawny (1650 – 1721) from Cornish Ballads & Other Poems. and which have been, ever since the imprisonment by James the Second of the of the seven bishops – one of them Sir Jonathan Trelawny – a popular proverb throughout Cornwall, the whole of this song was composed by me in the year 1825. I wrote it under a stag-horned oak in Sir Beville’s walk in Stowe Wood. It was sent by me anonymously to a Plymouth paper, and there it attracted the notice of Mr. Davies Gilbert, who reprinted it at his private press at Eastbourne under the avowed impression that it was the original ballad. It had the good fortune to win the eulogy of Sir Walter Scott, who also deemed it to be an ancient song. It was praised under the same persuasion by Lord Macaulay and by Mr. Dickens, who inserted it at first as of genuine antiquity in his Household Words, but who afterwards acknowledged its actual paternity in the same publication. 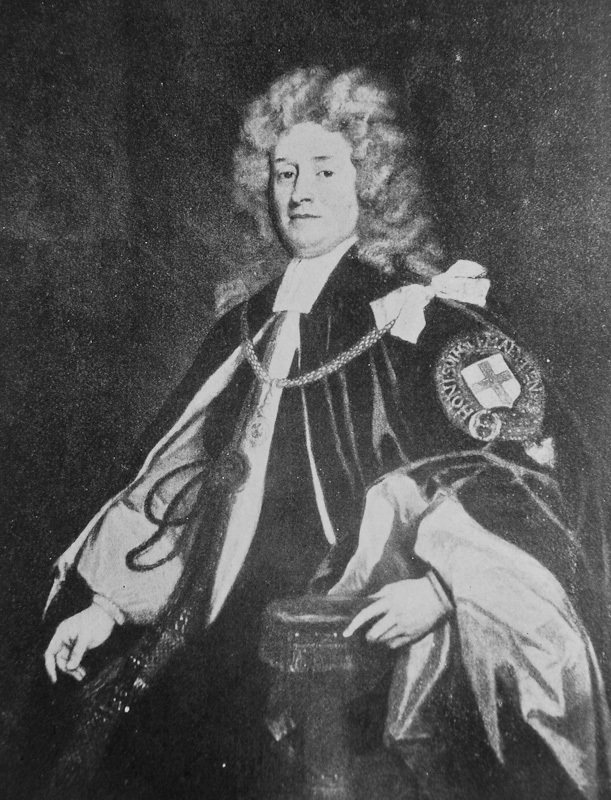 Although Hawker himself connects the original refrain of the song to the events of 1688, C. E. Byles, writing in The Life and Letters of R. S. Hawker, pp. 29-31, provides information relating to an earlier incident, which took place on 13 May 1627, when John Trelawny, grandfather of Bishop Jonathan and one of the leaders of the King’s party in Cornwall, was committed to the Tower by the House of Commons, for ‘certain offences against the liberty of free election’ and ‘contempt of the House’. He was held for about a month before being released by the King and created a Baronet, and it seems likely therefore that the chorus, around which Hawker wove his own ballad, may well date from at least 1627. – Bishop Jonathan Trelawny was born at Pelynt; the Jubilee Inn website has an excellent article about the imprisonment of the seven bishops and the uprising which followed, and mentions Hawker as the author of the song.